We’ve rated and reviewed seven of the best 17-inch laptops currently available. So, if you’re looking for a laptop for gaming, work, or casual use, that has a bigger screen, check out our recommendations below. Whether you’re looking for a high-end gaming laptop, or a professional workstation laptop, or even a budget-friendly laptop for casual use, one thing you’ll need to decide on is how big of a screen you want. Right now, the two most common screen sizes for laptops are 15.6-inches and 17.3-inches. If you’re someone who prefers larger screens, you’re in luck, because in this guide, we’re going to take a look at some of the best 17-inch laptops currently available. If you’re looking for a certain type of laptop, or you are working with a specific budget, the table below shows our top picks for the best 17″ laptops across a few different categories. We’ve chosen the best 17-inch laptop for gaming, the best workstation laptop with a 17-inch screen, the best value option, and the best budget 17-inch laptop. *For more information on the laptops above, click the “Read Review »” link and you will jump to our rundown on that laptop. To see our three Honorable Mention picks, keep scrolling down. If you’re looking for a high-end laptop for gaming that has a 17-inch display, you might want to check out the HP Omen X. The Omen X sports a 1080P resolution screen that comes with a whopping 120Hz refresh rate NVIDIA’s G-Sync technology. With a GTX 1080 graphics card included in the Omen X, it will easily be able to run games at max settings with high enough framerates to take advantage of the 120Hz refresh rate. And, the laptop also comes with an Intel Core i7-7820HK processor and 16GB of DDR4 memory. For storage, the Omen X comes with a 1TB hard drive and a 256GB SSD as well. The Omen X was out runner-up pick for the best GTX 1080 laptop overall, but our top pick, the ASUS ROG GX501 was a 15.6″ laptop. So, in terms of the best 17-inch gaming laptop out there, the Omen X is probably it. If you’re a professional who needs a high-end workstation-level laptop for graphics design or other intensive work and you want a larger screen, you might want to check out the Lenovo ThinkPad P71. The P71 doesn’t lack for high-end hardware, as it comes with an Intel Xeon E3-1505M processor, an NVIDIA Quadro P3000 graphics card, 32GB of DDR4 memory, a 1TB hard drive, and a 512GB SSD. And, perhaps the most stand-out featur eof the ThinkPad P71 is the fact that it comes with a 4K resolution screen. So, not only are you getting a larger screen with the 17.3″ display, but you’re also getting four times the pixels over a standard 1080P laptop. The ThinkPad P71 is a bit pricey, coming in at just over $3,000, but if you’re a professional in need of a powerful 4K laptop and you have the budget to accommodate it, the P71 is worth considering. In our opinion, the HP Omen 17 offers the best value for anyone who is trying to juggle a moderate budget with the need for a high-end option. The HP Omen 17 comes with a 17.3″ 1080P display that has a 144Hz refresh rate and comes with NVIDIA’s G-Sync technology. While the HP Omen 17 doesn’t quite have as powerful of a graphics card as the HP Omen X does, the GTX 1060 that it comes with should be strong enough to allow you to play the majority of games on max settings with high framerates. Even if you’re not a gamer, the HP Omen 17 would be worth considering as it also comes with an Intel Core i7-8750H processor, 16GB of DDR4 memory, a 1TB hard drive, and a 128GB SSD. However, you could save a bit of money by opting for the ASUS VivoBook that is listed in the Honorable Mentions section below. If you’re looking for a high-end gaming experience, especially in competitive titles, you might be better off with one of the options above because of their higher refresh rate and G-Sync technology. However, if you want a 4K laptop for the higher screen resolution, the Dell Inspiron 4K is your best bet among GTX 1060 laptops. Need a more affordable laptop that comes with a larger 17.3″ display? We’ve essentially made two budget-friendly picks in this guide: this Dell Inspiron laptop and the Acer Aspire laptop mentioned in the Honorable Mention section below. If you’re looking for an ultra-cheap laptop, the Acer Aspire comes in at under $600. However, in terms of power it can’t quite stack up to this Dell Inpiron model which comes in right at ~$900. This Dell Inspiron model comes with a 1080P display, an Intel Core i7-8750H processor, 8GB of RAM (which can easily be upgraded to 16GB in the future), a GTX 1050 Ti graphics card, a 128GB SSD, and a 1TB hard drive. While this laptop isn’t as well-suited for gaming as some of the other options above, the combination of the 8750H and the GTX 1050 Ti will be good enough to play most games on medium-to-higher settings with a good framerate. And, if you’re not a gamer, the high-end processor and 8GB of memory should be more than enough for your needs. Another option you have if you’re looking for a 17-inch gaming laptop is the ASUS ROG Strix Scar. We chose the Scar as our top pick for the best GTX 1070 laptop on the market, but in terms of price-to-performance, we still think the HP Omen X is the better overall option for gamers. The main difference between the HP Omen X and the ROG Strix Scar is the fact that the Scar comes with a less-powerful GTX 1070 graphics card and the HP Omen X comes with the more powerful GTX 1080. And, while the difference between the 1080 and 1070 in terms of in-game performance won’t be too significant on a 1080P display (which both the Scar and the Omen X have), the fact that the HP Omen X comes in at only about ~$100 more than the ROG Strix Scar makes the Omen X, in our opinion, the better value option out of the two. So, while either option would be a good choice for gaming, if you need as much in-game performance as possible, we’d recommend the HP Omen X for just a little more. It comes with a 1080P display, an Intel Core i7-8550U processor, 16GB of DDR4 memory, a GTX 1050 4GB graphics card, a 256GB SSD, and a 1TB hard drive. While the GTX 1050 graphics card won’t be enough to max out more demanding games on the 1080P display, it should be able to run non-demanding games on max settings, as well as play more graphics-intensive games on lower-to-medium settings. Although, if you are looking for a better CPU-GPU combination, the Dell Inspiron listed above would be a better option while costing quite a bit less. If you’re working with a tight budget, but you still want to get a laptop with a 17-inch display, then you might want to consider the Acer Aspire. 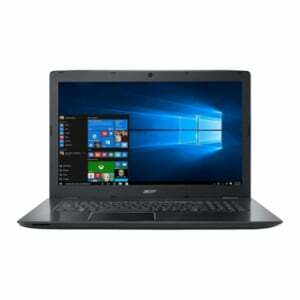 This laptop comes in at a little under $600 and comes with a 1080P display, an Intel Core i5-7200U CPU, 8GB of DDR4 memory, and a GeForce 940MX GPU. For storage, this laptop comes with a 256GB SSD, but there is no secondary mechanical hard drive. If you’re a gamer, you can expect this Acer Aspire laptop to run non-demanding games on lower-to-medium settings, but it probably won’t hold up for most demanding games. You can also check out our guide on the best gaming laptops under $500 for more affordable options, although, you won’t find a 17-inch display on those laptops. If you’re in the market for a new laptop and you want as big of a screen as possible, the 17.3-inch laptops listed above are worthy options to consider. So, whether you’re looking for a powerful gaming laptop, or a workstation-grade laptop for professional use, or even an affordable laptop for casual use, there should be an option above that will work for your needs and budget.